So it’s been a busy week for the community so far, we have our newfound character builder, a virtual tabletop announced and lots of talk about the Monster Vault. Another cool prop by SlyFlourish and Living Traps over at the Save vs Death blog were some personal highlights for me. 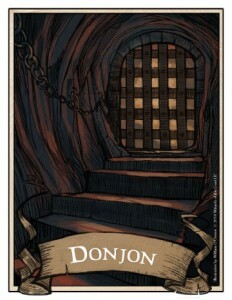 This week’s #D5C is dedicated to dungeons, because I love them and because I know you do too! I love the responses I’m getting from people and I hope the series is helping us feed off of each others ideas as well as maybe earn a few people some new followers for their genius ideas! Enjoy! DM’s – what game / story (or meta) elements make your players the most nervous at the game table? @BlindGeekUK – the NPC’s knowing all about them. @DigitalDraco – I find sound effects and frenetic (or otherwise appropriate) battle music are particularly useful! @Neldar – I threaten time and traps. Time can be in relation to stopping rituals, messengers, war councils, etc. @Rolling20s – Suffocation. In #d20 and#Pathfinder, the suffocation rules are vicious. @WolfSamurai – That they’ll run into a batch of monsters ~and~ have to deal with a trap/puzzle at the same time. @Soklemon – Minotaur. Big minotaur. @TrollitC – I prefer a competing party, coming at them from the other direction. Or Minotaurs. @WastexGames – I did the minotaur once, also like shifting walls and caving in ceilings! Randomly rolling dice behind the screen & grinning at them but not giving any information. I do it just for fun! @SamlDanach – Noises in the walls. Could be rats, or Tucker’s kobolds, or a trap activating. But nothing is visible. @TheAngryDM – Time. A sense of urgencey. @ExemplaryDM – Kruthicks. Gave the PCs partial group invisibility, had them stealth/navigate through a 3D hive chamber. @TWWombat – A competing party of incorporeal undead minotaurs with fear auras that cause ongoing psychic damage. @PDUnwin – Well, not minotaur, but I do like there to be a variety of denizens hunting or helping the party. Traps inside dungeon crypts should always involve…. @D20Monkey – pit traps, poison darts, and sharp blades. @Neldar – Other traps! Push into pits, flood into crushing walls, explosive runes! @D20Monkey – an insight check reveals the “exit” to be illusory room within the crypt. @EtherWorld – to discover someone in their party is actually missing. @Brindy – have an aggressive army waiting for them outside the exit. @TheRealEdwin – An unexpected event occuring with nearly permanent repercussions. @TwoScoops1 – while the party was busy, BBEG was causing mayhem! @Neldar – Change the entire world while they were gone. @DeadOrcs – They all wake up and it was just a dream. Also, They encounter a little bald dude in a robe. Standing next to him is a small bleaty unicorn. “This room is completely empty and devoid of notable details” Is there really something there? How dastardly of a DM can you be? @WolfSamurai – Coin flip. Half the time, there is something there. Half the time there isn’t. All the better to ramp up tension. @EternalDarkness – empty rooms are great just as empty rooms – watch the PCs go NUTS, completely sure something is there. DM’s, what is your favorite cursed / tricky item you like to place deep into a dungeon? @D20Monkey – a Ring of Mirrored Desire (a ring of reverse wishes, essentially). @PDUnwin – I’m fond of anything that lets the enemy spy on the party. Suddenly, an unconcious baddie X crashes through the back wall and skids to a stop in a twisted heap. Moments later, baddie Y emerges from the new hole, stooping to fit his hulking frame though. He raises his (insert weapon), and delivers a finishing blow to baddie X. Then, he turns his gaze towards you….